Molecular mass is the most fundamental characteristics for proteins and peptides. It directly reflects the structural integrity of proteins, and hence it is commonly applied in identification of proteins and peptides. To better assist the scientific research of our clients, MtoZ Biolabs provides macromolecular mass measurement service based on Bruker ultrafleXtreme™ MALDI TOF/TOF, and high-resolution protein mass measurement service via nano LC-MS. This service can be applied to accurately analyze the molecular mass, subunits, and dimerization/polymerization of multiple biotechnological molecules, including proteins, peptides, antibodies, and vaccines, etc. •	Measurement of the molecular mass of protein/peptide/antibody/vaccine, etc. Quantity A total of 10-50 ug proteins are required. Purity Purity of protein sample should be >90%; Detergents, such as SDS and Triton-X, salt, Tris, and other contaminants should be as low as possible. *Customers are recommended to contact us for detailed sample requirements before sending your samples. In this study, the molecular mass of the protein sample from one of our customer was analyzed by MALDI-TOF. 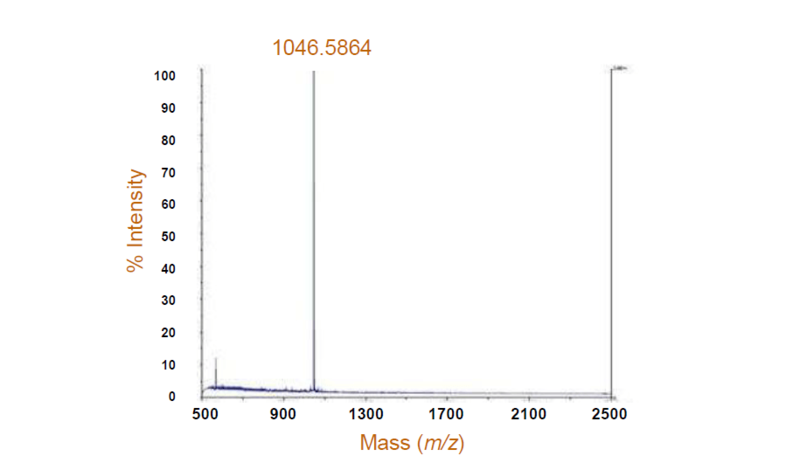 The result below showed a very significant peak at 1046.6 Da with intensity of nearly 100%, which indicated the protein mass was 1046.6 Da with high purity. The measured protein mass was consistent with the theoretical value.